LONDON–According to a market study released by Technavio, the global carbon composites market is expected to grow at a compound annual growth rate (CAGR) of more than 11 percent through 2021. The market research report, titled "Global Carbon Composites Market 2017–2021," provides an in–depth analysis of the market in terms of revenue and emerging market trends. The report also includes up to date analysis and forecasts for various market segments and all geographical regions, Technavio said in a press release. The anticipated growth of the global carbon composites market can be attributed to factors such as high demand for fuel–efficient, lightweight vehicles around the world, rise in the demand for energy from renewable sources, and efficient functionality. Industries such as construction, wind energy, and sports are fostering the demand for carbon composites materials. 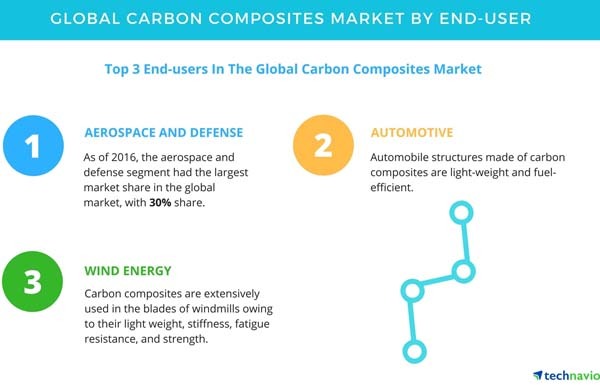 Technavio's analysts categorize the global carbon composites market into five major segments by end user. The segments are sporting goods, automotive, wind energy, aerospace and defense, and "others." Technavio (www.technavio.com) said that the top three end–user segments of the global carbon composites market are aerospace and defense; automotive; and wind energy. In the aerospace industry, carbon composites are extensively used as carbon fiber reinforced plastics (CFRP). This can be attributed to their properties, such as lightweight and high performance, which help to reduce emissions and lower the fuel requirements. Carbon fiber reinforced plastics are used in manufacturing structural parts of rockets, satellites, and all types of aircraft, such as commercials, passenger, and freight. "The global defense expenditure has increased, and this is expected to drive the market for military planes," said Kshama Upadhyay, a lead textile, fiber, composites research analyst from Technavio, in the release. "The countries responsible for the growth in the global defense market are the Middle Eastern countries, the U.S., North Korea, and China. The U.S. is a major contributor to the global defense market." The high adoption of carbon composites in the automotive sector can be attributed to the rise in demand for fuel–efficient and lightweight vehicles around the world. Automobile structures made of carbon composites are lightweight and fuel–efficient. These materials are used in the exterior, interior, structural, electronic and electric, and powertrain components of automobiles. "SGL will be providing carbon composites for i3 and i8 electric and hybrid BMW cars," said Kshama. "Tesla and Hyundai are also expected to use carbon composites in electric cars. This shows that automobile manufacturers are readily opting for carbon composites to manufacture fuel–efficient and lightweight vehicles. Thus, in the coming five years, the consumption of carbon composites in the automotive sector will grow." Carbon composites are also extensively used in the blades of the windmills due to their light weight, stiffness, fatigue resistance, and strength. Recent years have seen significant adoption of renewable sources, such as wind and solar, for energy production. In 2015, investments of more than $300 billion (USD) was made on clean energy sources around the world, according to Technavio. In terms of new windmill installations, China was the leading country in 2015 with a new installed capacity of more than 30 Gigawatts (GW), followed by the United States with a new installed capacity of more than 8 GW. In China, the year–over–year (YoY) growth rate of 2014–2015 was more than 25 percent, and in the United States, it was more than 12 percent, Technavio said. The top vendors highlighted by Technavio's research analysts in this report are Hexcel, SGL Group, Solvay, TEIJIN, and Toray Industries.